What other galaxies populate the Local Group of galaxies? The three dozen or so galaxies in the Local Group other than Andromeda and the Milky Way are all dwarf galaxies. They vary in size from about one-half to one-thousandth the diameter of Andromeda and the Milky Way; they contain only a few million to a few billion stars each (compared to Andromeda and the Milky Way, which contain hundreds of billions of stars). The largest of these Local Group dwarf galaxies are the Large Magellanic Cloud and the Small Magellanic Cloud, which orbit the Milky Way, and Messier 32 and Messier 33, which orbit Andromeda. Other well-known Local Group dwarfs include IC 10, NGC 205, NGC 6822, and the Sagittarius dwarf galaxy. In recent years, a number of tiny “mini-galaxies” containing fewer than a million stars have also been discovered. 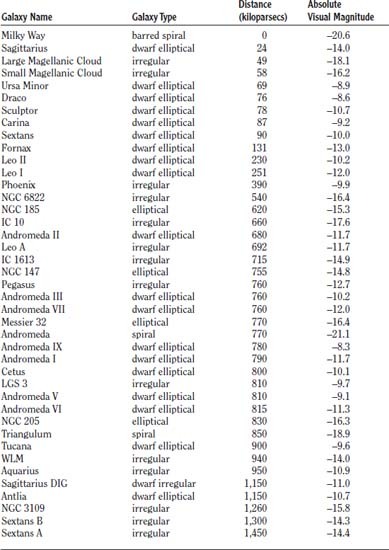 The table below lists some of the Local Group galaxies.